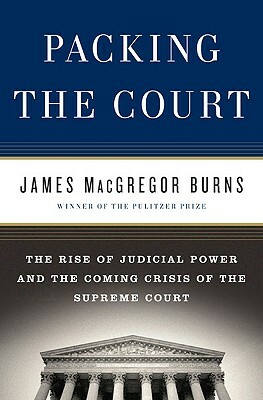 For decades, James MacGregor Burns has been one of the great masters of the study of power and leadership in America. Now he turns his eye to an institution of government that he believes has become more powerful, and more partisan, than the founding fathers ever intended-the Supreme Court. Much as we would like to believe that the Court remains aloof from ideological politics, "Packing the Court" reveals how often justices behave like politicians in robes. Few Americans appreciate that the framers of the Constitution envisioned a much more limited role for the Supreme Court than it has come to occupy. In keeping with the founders' desire for balanced government, the Constitution does not grant the Supreme Court the power of judicial review-that is, the ability to veto acts of Congress and the president. Yet throughout its history, as "Packing the Court" details, the Supreme Court has blocked congressional laws and, as a result, often derailed progressive reform. The term "packing the court" is usually applied to FDR's failed attempt to expand the size of the Court after a conservative bench repeatedly overturned key elements of the New Deal. But Burns shows that FDR was not the only president to confront a high court that seemed bent on fighting popular mandates for change, nor was he the only one to try to manipulate the bench for political ends. Many of our most effective leaders-from Jefferson to Jackson, Lincoln to FDR- have clashed with powerful justices who refused to recognize the claims of popularly elected majorities. Burns contends that these battles have threatened the nation's welfare in the most crucial moments of our history, from the Civil War to the Great Depression-and may do so again. Given the erratic and partisan nature of Supreme Court appointments, Burns believes we play political roulette with the Constitution with each election cycle. Now, eight years after "Bush v. Gore," ideological justices have the tightest grip on the Court in recent memory. Drawing on more than two centuries of American history, "Packing the Court" offers a clear-eyed critique of judicial rule and a bold proposal to rein in the Supreme Court's power over the elected branches. Keywords: GOVERNMENT. JUDICIARY. SUPREME COURT. PRESIDENTS.